We offer the Bostitch MIIIFS and Spotnails FS7550 Flooring staplers - for solid and engineered hardwood flooring installation. Also we offer Spotnails Radiant Floor staple guns for anchor tubing used in radiant heat flooring. Spotnails FCL2650 Air Hardwood flooring Tool. Uses 16 Ga 2-inch L Cleats. FS7550 Flooring stapler. 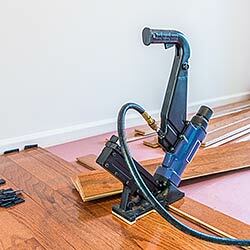 Uses Bostitch 15S4 Staples 15 Ga.
Spotnails Flooring stapler for 3/4-inch solid hardwood floor. Similar to Bostitch MIIIFS. Bostitch MIIIFS Flooring Stapler 15 GA. Uses BCS15 Staples. Bostitch MIIIFS Flooring stapler for 3/4-inch solid hardwood floor installation. Spotnails WS4840W6 wood flooring tool is designed for most tongue and groove flooring and Valinge G2+ type locking systems. Spotnails X1S1640RFH Radiant Floor staple gun. Uses 1-inch crown 16 Gauge Spotnails 1600, Bostitch 16S2 staples. NEW Spotnails X1S3640RFH Radiant Floor staple gun for Anchor tubing used in radiant heat flooring. Uses Senco P & Duo-Fast 1700 staples.